Today is a good baking day. It is at least 20 degrees cooler than yesterday. Saturday was an out of doors kind of day: picked up dog poo, unwrapped the camper trailer, fixed bicycles, got out the lawn chairs and table, and had lunch outside. Truth be told, Hubby did most of the work. I made the lunch and brought it outside. The poor dog; he did not know what to do with himself at first. He does not seem to like laying on the lawn or sitting on the patio. By patio, I mean a section of concrete squares that surround the basement bulkhead, nothing pretty and designed. 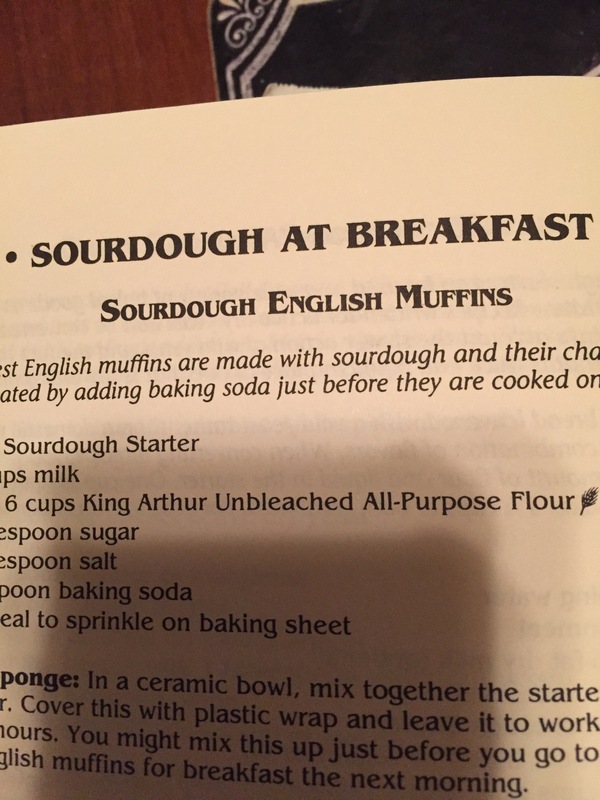 Again I am making something from King Arthur Flour. Their catalog comes in the mail trying to sell me all sorts of baking items and has these few recipes in it. 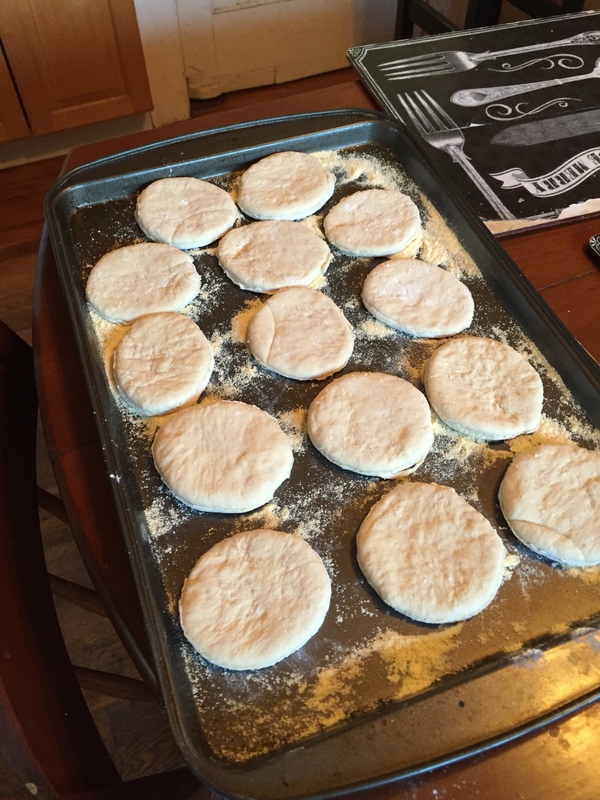 For this recipe they want you to use an Irish-style flour and some baking papers. Well, I used whole wheat flour (Bob’s Red Mill) and a jumbo muffin pan and two 8-ounce ramekins. I used raisins because I did not have currants, and I did not toast the walnuts. The recipe link is here: the recipe. 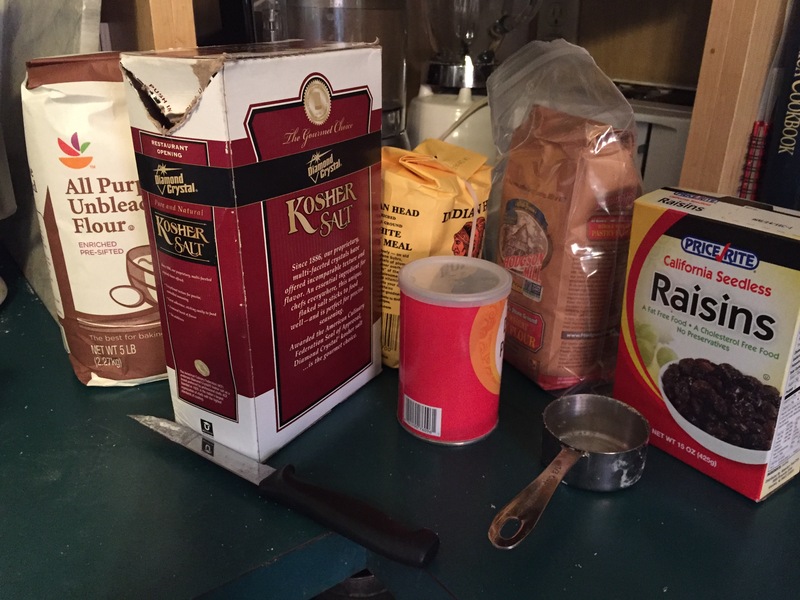 2 cups all-purpose flour; I always use unbleached but differing brands. 1 teaspoon kosher salt; I use kosher salt because I used to watch Alton Brown and i think he always used it. 2 tablespoons honey; remember to spray your spoon with cooking spray first and it will slide right off; I forgot. The instructions are simple and fabulous: Mix and knead all the ingredients until the dough is smooth and elastic. This took just over two minutes in the Kitchen-Aid stand mixer with the bread hook. Grease the bowl, cover, and let rise until puffy about 60-90 minutes. I let mine rest for about 75 minutes. This makes eight large rolls so I used the jumbo muffin pan and needed two more spaces so I used two 8 ounce ramekins. I sprayed these with cooking spray. 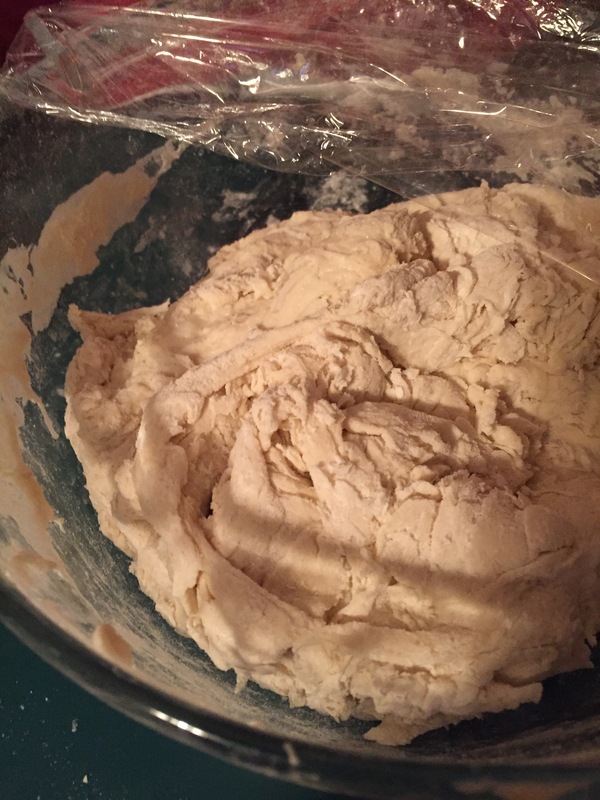 After the first rise, gently deflate the dough. Ha! 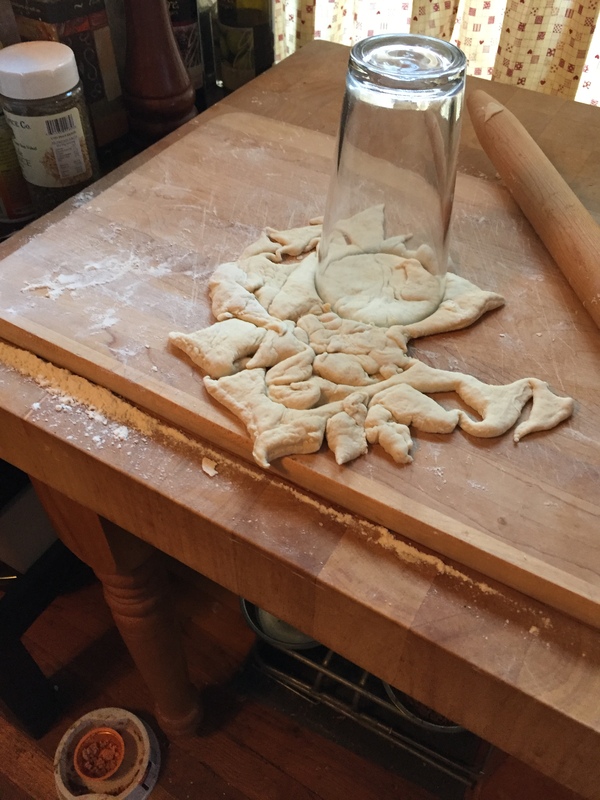 Mom always called this “punching down the dough. Divide this into 32 pieces. So divide the dough into eight pieces. I like to use a bench cutter/scraper. Cut each of those pieces into four and roll each piece into a ball and place four in each cup. Cover and let rise until they crest over the rim. 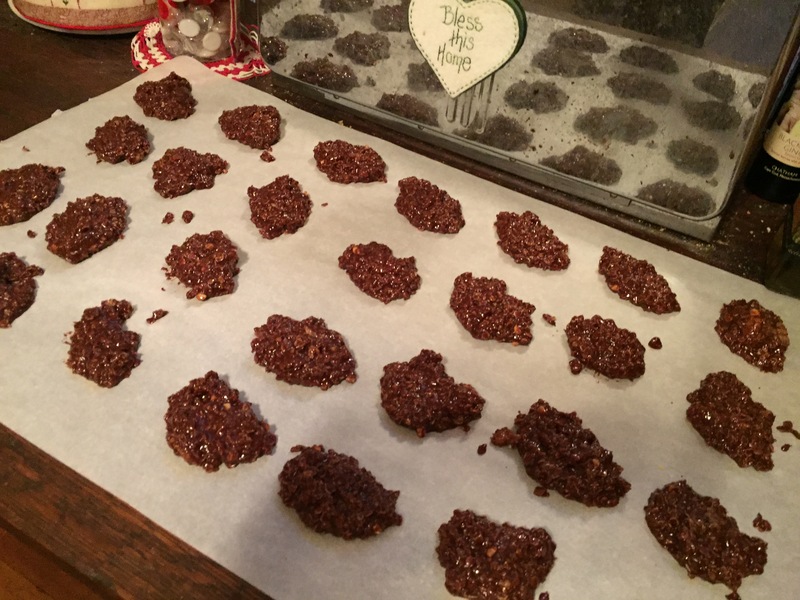 (I could not find the height of the special papers that KAF was promoting so I figured 60 minutes was in between the 45-75 minutes in the recipe. Bake in 350 degree F oven for 25-30 minutes. Mine took 27 minutes. Brush with 1-2 tablespoons melted butter, if desired. I desired. And rolls for dinner. I think one of these with a cup of yogurt and fruit would be a fabulous on the go breakfast too. 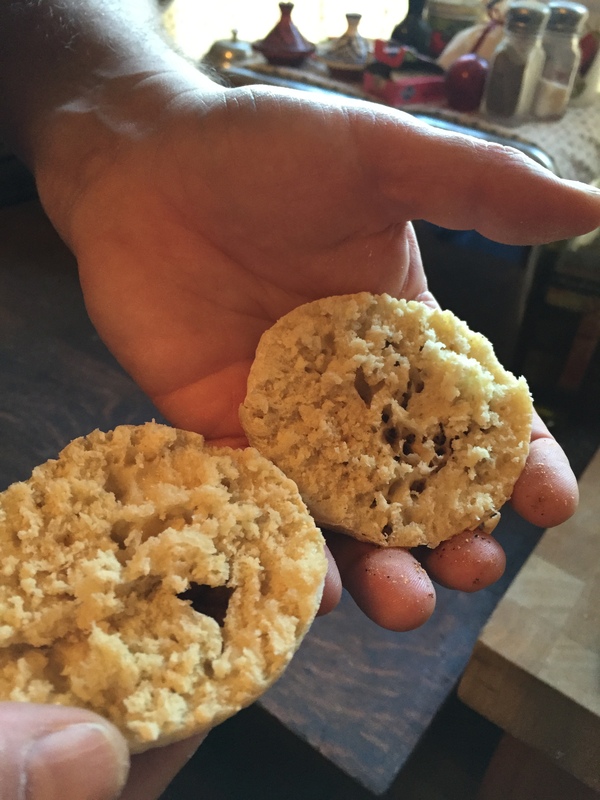 They taste sort of like a yeasted Irish soda bread with a touch of whole wheat. Gotta be healthy, right? Winter has arrived with the first major snowstorm. Hubby estimates there is about 12 inches of snow in the yard and three foot drifts where the plows cleared the roads. That was more snow than we expected. There are areas of our state that got more than that as well as less: nothing to a dusting to 4 inches to 16 inches. But living in the Northeast means snow for winter. Although we had become spoiled by the mild temperatures thus far. I’ve done as much as I can about the weather, how about you? Knowing that the snow would continue through the night I planned that we would have a Sunday morning in while hubby cleared the walks and driveway and cars. Knowing that I have a somewhat neglected sourdough starter in the fridge that needed feeding I planned to make waffles for breakfast. Knowing that the recipe calls for buttermilk I created “sour milk” with the age old technique used by my Mom, add Tablespoon of lemon juice or vinegar to measuring cup for each one cup of buttermilk needed. Knowing the sourdough batters often need time to “ripen” I got out my cookbook and prepared the “sponge” the night before. I am using the recipe on page 542 of the book. The batter is for pancakes but can be used to make “the lightest, tastiest waffles you’ll ever eat.” The sponge is made by combining the flour, the sugar, and t he buttermilk and then adding the starter. Blend well and let rest for two hours or overnight. In the morning the rest of the ingredients are added. This makes a lot of batter! Now make the waffles using the directions for your waffle iron. I have a nice waffle maker given to me by my wonderful daughter and son-in-law. These turned out crisp on the outside and tender on the inside. Definitely a keeper recipe! Greetings! I have been thinking about cookies. When I started thinking about cookies there were 10 weekends before Christmas. I think “one batch of cookies per weekend”. That would be plenty of cookies and a nice variety, actually a large variety, but not quite a dozen different types. I begin a list of cookie recipes: “daddy holiday oatmeal”, cappuccino flats, gingerbread?, spritz?, hmmmmm? I go through my handy dandy KAF 200th Anniversary Cookbook and see what might be in there. I do this because I have too many cookbooks and this concentrates my mind in one place. The problem is I don’t find a great deal in there that interests me. In fact there were maybe three. 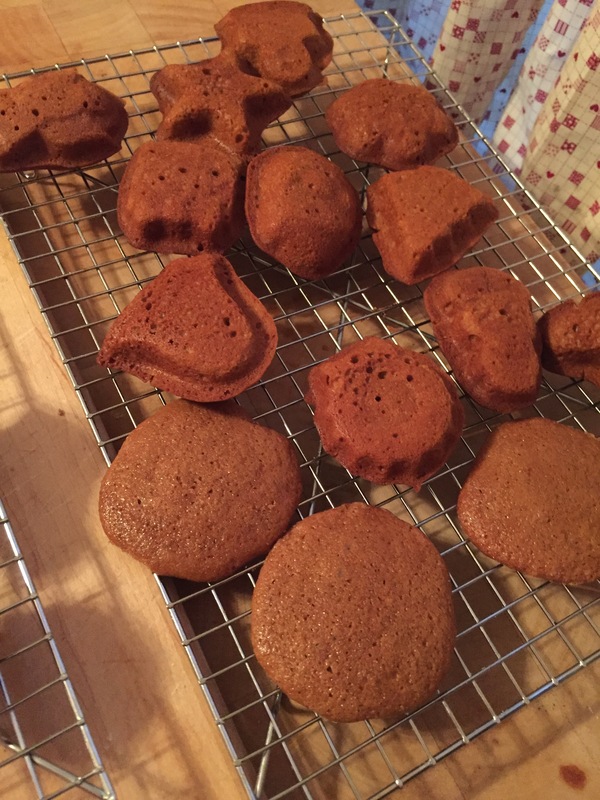 So I made a half recipe of the molasses cookies. These did not turn out how I expected them to. I was thinking along the lines of a sugar covered crinkle cookie but these were cake-like. Would be good to make a filling and make a sandwich cookie. So I eat a few and freeze the rest. The dough was soft and batter-like which surprised me. I had bought a Christmas cookie pan/sheet, not quite sure. I thought this pan might be useful for this cookie batter. So here they are. Interesting little muffin type cookie cakes. These actually tasted better the next day. So we ate a few and froze the rest. You may be wondering at this point how is the title of this blog essay relevant. Hold your horses; I’m getting there! At work I make a brash statement that I will bake something for the group. Chocolate is the preference. Thinking that hubby will be working late this gives me opportunity to bake something instead of fixing supper. All day I am trying to think of something besides chocolate cake to make. And I do have recipe for a very nice double chocolate cookie but I used the last of my molasses the other day. 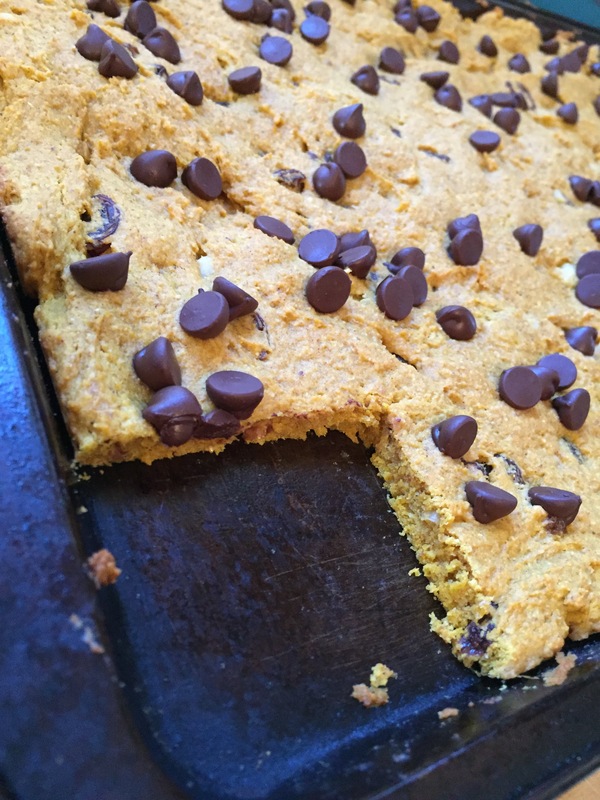 No-Bake Cookies come to mind. They are chocolate. I have the ingredients. Now I have to find the proper recipe. This cookie is known by several names. Some people call them haystacks, boiled cookies, and such. There are different recipes that change the amounts of the ingredients. My sister recalls the combination of ingredients that Mom used. She published it in one of those recipe collection booklets that organizations assemble for fund raisers. I also have Mom’s original typed version. While looking for these I flip through the large index file box that holds a lot of Mom’s recipe clippings. It occurs to me that I could just bake through the cookie section of this. It’s an idea. Would I do it? A lot of these call for shortenings like Spry and Crisco. I would have to substitute butter. Hmmmmm? 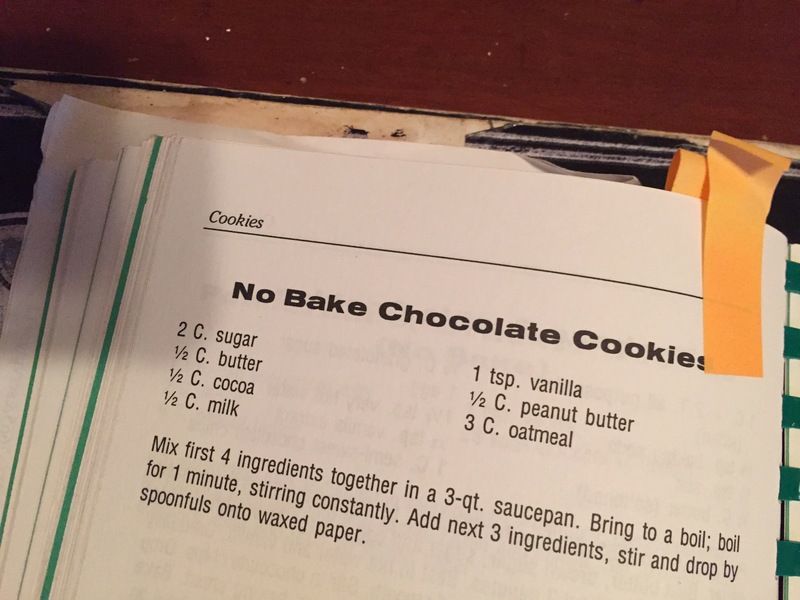 I gather the ingredients for the No-Bake Cookies. Basically it is 1/2 cup of everything except the vanilla, sugar, and oatmeal. Mix 2 Cups sugar, 1/2 Cup butter, 1/2 Cup Cocoa, and 1/2 Cup milk in a large saucepan. Bring to boil, boil one minute, stirring constantly. Remove from heat. 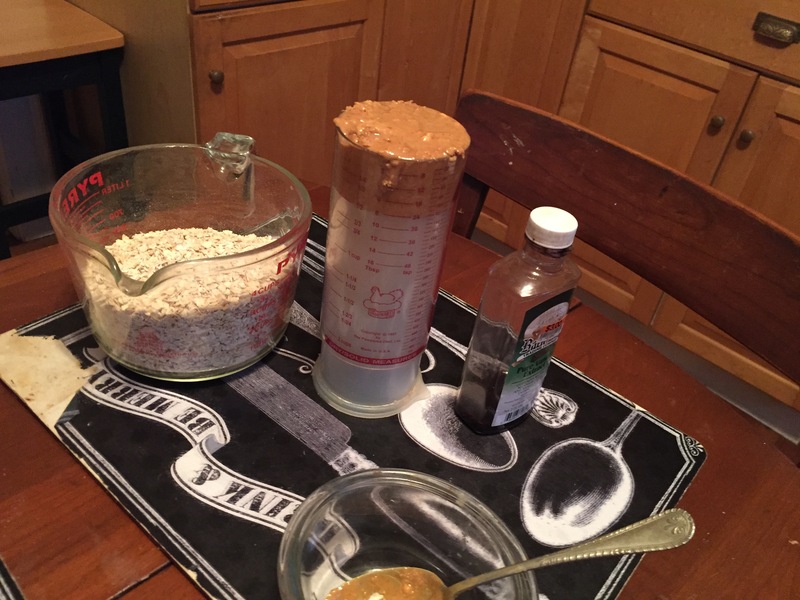 Stir in remaining ingredients: 1/2 Cup peanut butter, 1 teaspoon vanilla, and 3 Cups oats. Drop on waxed or parchment paper. 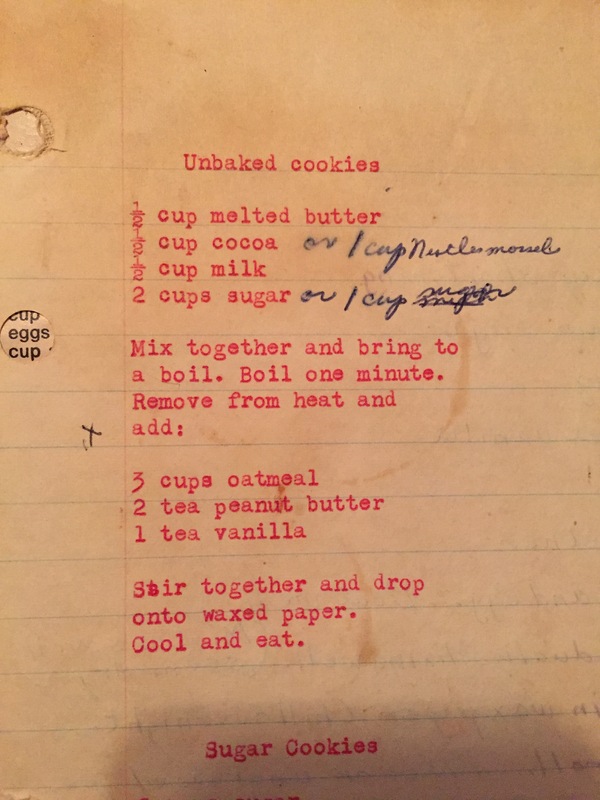 And like my Mom’s typewritten instructions “cool and eat”. 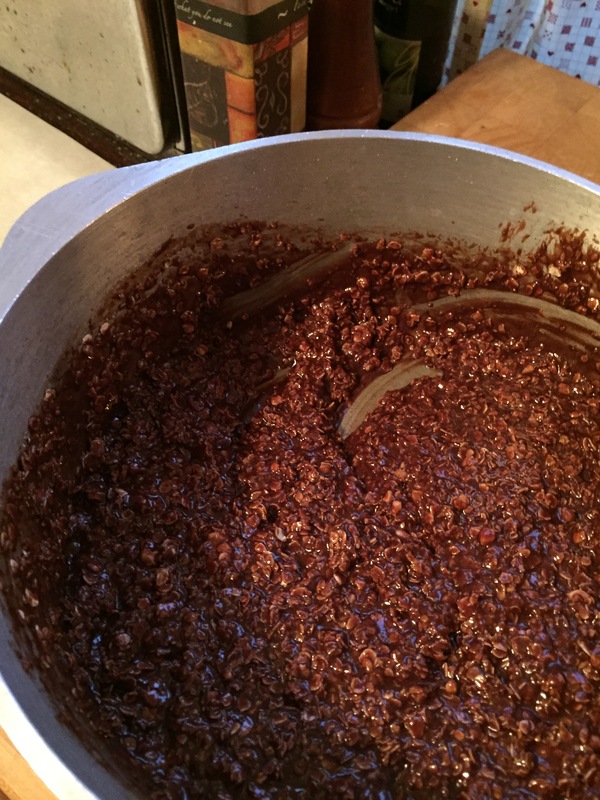 While I am stirring in the remaining ingredients the aroma is chocolatey and peanutey and smells just like my childhood. I did not expect such a vivid olfactory memory. But there it was, and I savored it. Thank you Mom! PS: I just noticed how my Mom’s calls for 2 teas peanut butter and my sister writes it for 1/2 Cup. What’s this about? Very interesting. I decide to make sour dough “something”. This will be for breakfast so I ask if it should be pancakes, waffles, or English muffins. It is the latter than would be preferred by the other human resident of my house, the hubby. The cats don’t get a vote! I open the KAF 200th Anniversary Cookbook and read the recipe and instructions (Page 538). 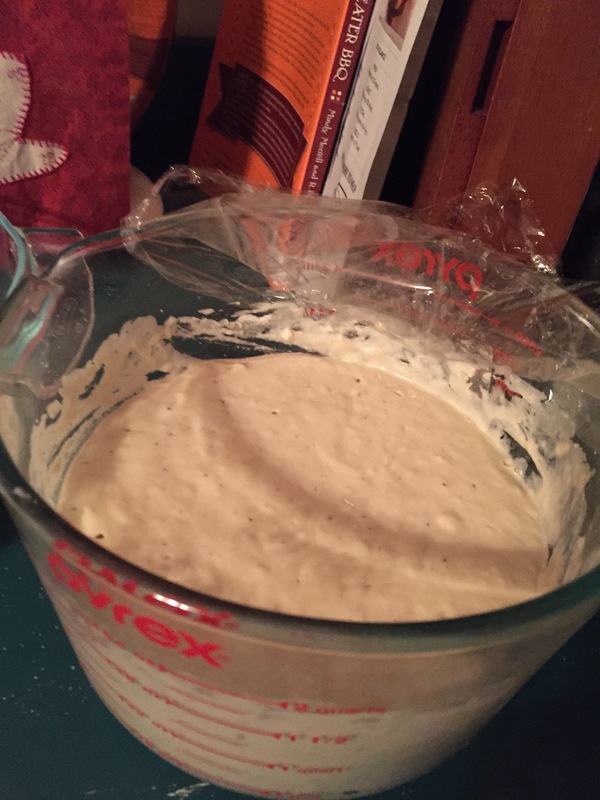 With raised doughs it is necessary to read through the recipe to know the timing of the rises to determine the amount of time needed for the end product. 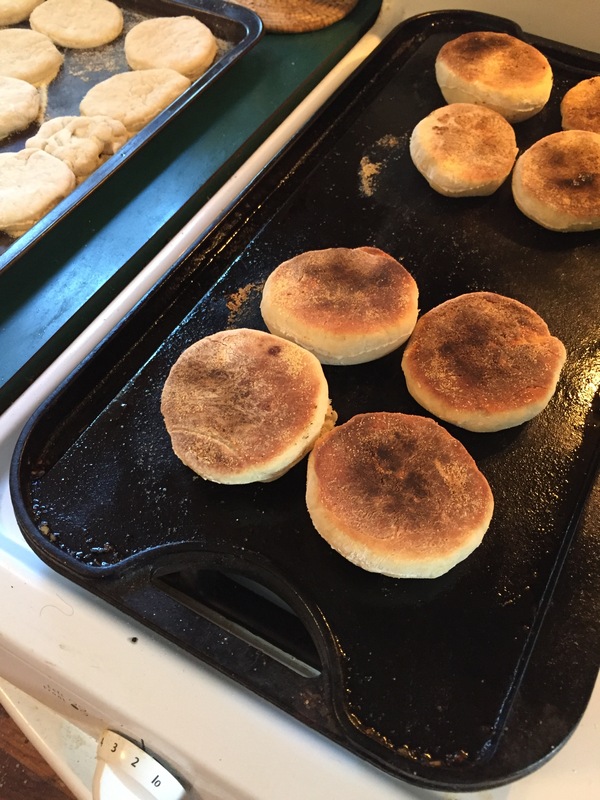 English muffins will be fun as well since they are cooked on top of the stove and not baked in the oven. The sponge is made by mixing together the starter, milk, and about 3 cups of the flour. Mix well and cover with plastic wrap for 2-24 hours. I tell myself I must remember to get up at a reasonable hour on this weekend morning to prepare the dough. Made the sponge at 9:30 PM and will plan to get up 7 AM. 1 Cup sourdough starter; 1 ½ C milk; 5 ½ C Flour; 1 Tab sugar; 1 Tab salt; 1 teas baking soda; cornmeal to sprinkle on baking sheet. Mix the rest of the dry ingredients minus the cornmeal in a bowl and then mix this into the sponge. It takes some work to get all incorporated together. Then let rest for about an hour. Now for the “fun” part: rolling the dough out thin. This is easier said than done but finally I get it to where it seems good enough to cut. I try a number of items but settle on a round drinking glass that is 3 ½ inches in diameter. My biscuit cutter seemed too small as the recipe said they shrink as they cook. These were a great success. I am glad I had a griddle so I could cook more than a few in a skillet at the time. After resting the cut outs on the cornmeal covered baking pans for 15-20 minutes and heating the griddle and spraying it with cooking spray, they cook ten minutes on each side. This recipe made 24 so I now have two sets of six fork-split muffins in freezer bags in the freezer for future enjoyment. 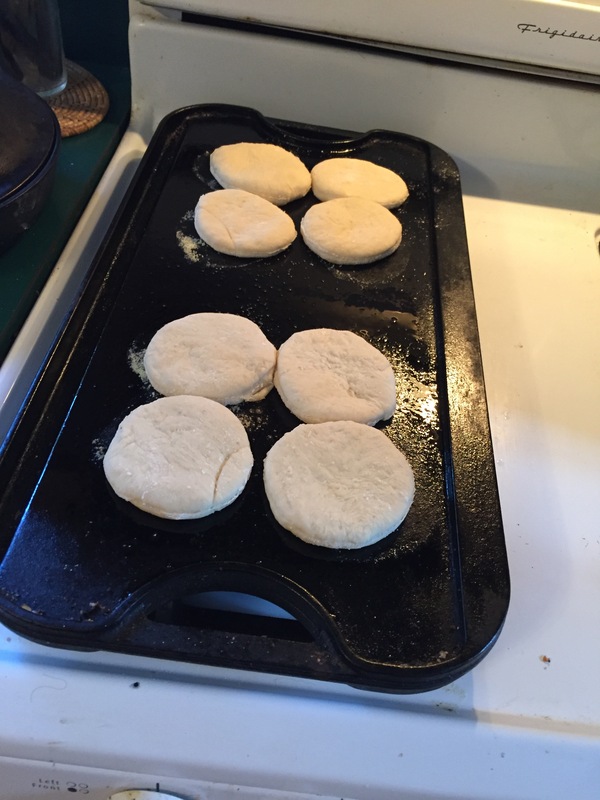 Now we can make our own “egg mcmuffins” with the baked eggs from the “Planning Breakfast” post. I had previously been putting the egg in the middle of a muffin (wheat-germ whole wheat, also from the KAF cookbook). I mentioned this to a colleague at a McDonalds the other day when I ordered just a coffee and she was ordering lunch. The cashier was in good spirits and showed good humor. He was a pleasure to order from. I rarely go to McDonalds and only for the coffee when there is the “medium for $1” special. I was disappointed with the pumpkin spice coffee as they use syrup for the flavoring. I suppose I will just have to go across the street and pay more for the DD coffee in the future. Live and learn. 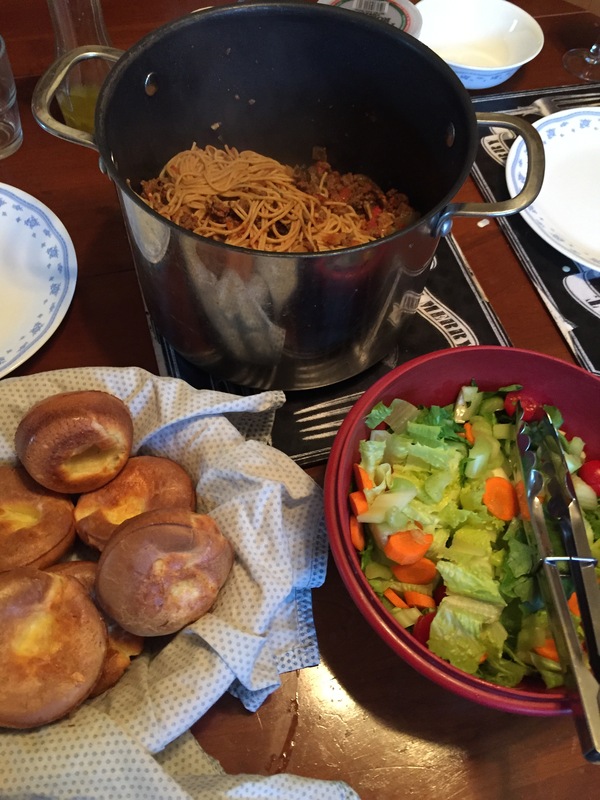 First: I miss having the kids around to eat all this food. Sometimes I like to set a table with a well-rounded meal: meat, veggie, bread, dessert, etc. My step-daughters are good eaters. They always seemed to rave about my cooking and baking. I miss having them around the dinner table. My son became a foodie and likes good tasting food of good quality. 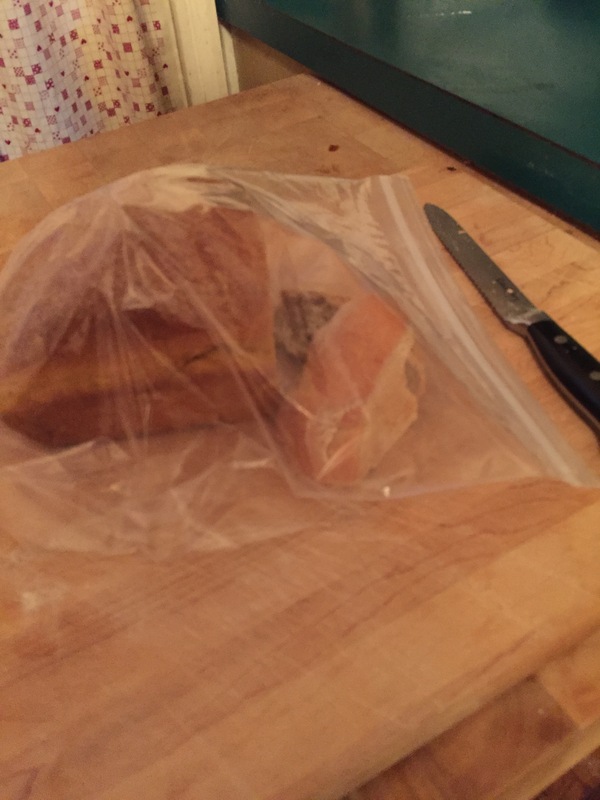 There came a time when he stopped eating packaged bread so I had to make bread or have bakery bread on hand, along with plain yogurt, fruit, carrots and the like. Hummus was very popular with him. My daughter eats well of the basic foods minus cheese and milk products. Now these family dinner tables are reserved for an occasional weekend visit or holiday meals. The wee ones are growing up and going out on their own, establishing families and lives of their own, as it should be. But I miss them. 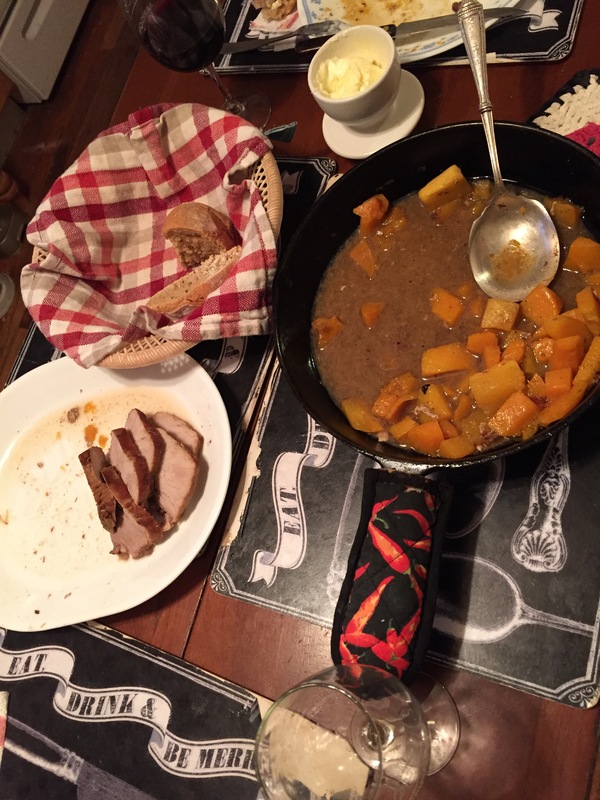 Leftovers are not always a problem. Sometimes leftover bread becomes a problem. Especially should I get the notion to make a new loaf or muffins when the first batch has not been completely consumed. Like this evening. I was reading the KAF 200th Anniversary Cookbook again and looking at batter breads. I have half a loaf of pumpkin bread and a few pieces of Artisan bread left here! 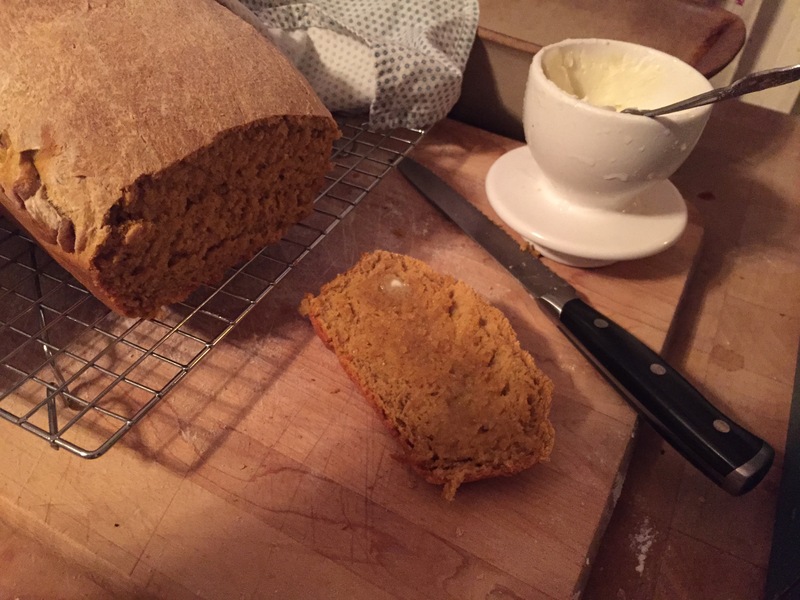 Second: I decided to make a yeast pumpkin bread off the KAF website. It was a cool fall day and we were hanging around the living room parallel playing on our computers in between the hubby sleeping off and on due to having come down with a cold. You must understand that there are members of my family that think I am a fabulous baker. I am mediocre at best but I do bake which makes me unlike other people who do not bake or obsessively think about baking. Actually I must correct this thought. I am not mediocre; I am pretty darn good, just not always creative, or that knowledgeable about the science of baking. Mind you I have several books in my repertoire/collection that could teach me about the science but I have not memorized the information. I can tell you bits and pieces only. 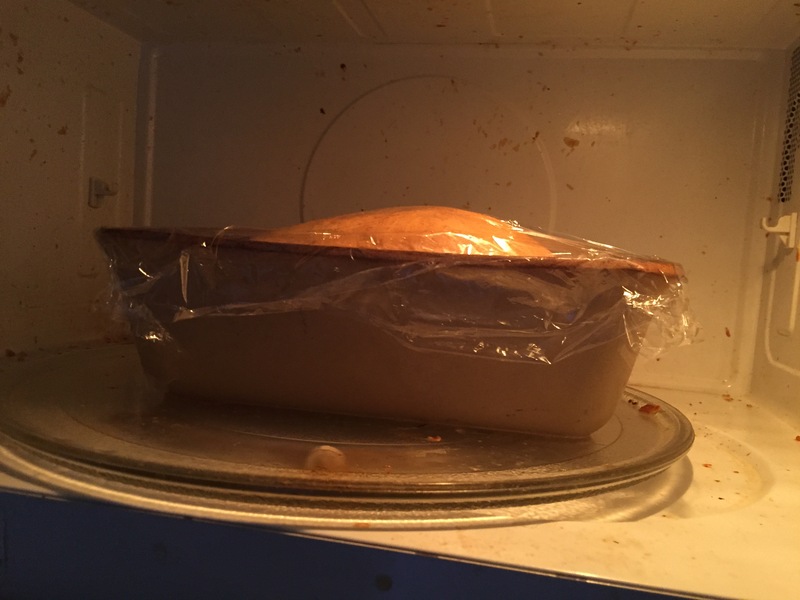 So the KAF on-line baker told me to boil water in the microwave, remove the boiling water, and put the dough in there to rise. This creates a warm moist environment that the yeast will like. It worked! So after the second rise I baked the bread in the oven and voila! 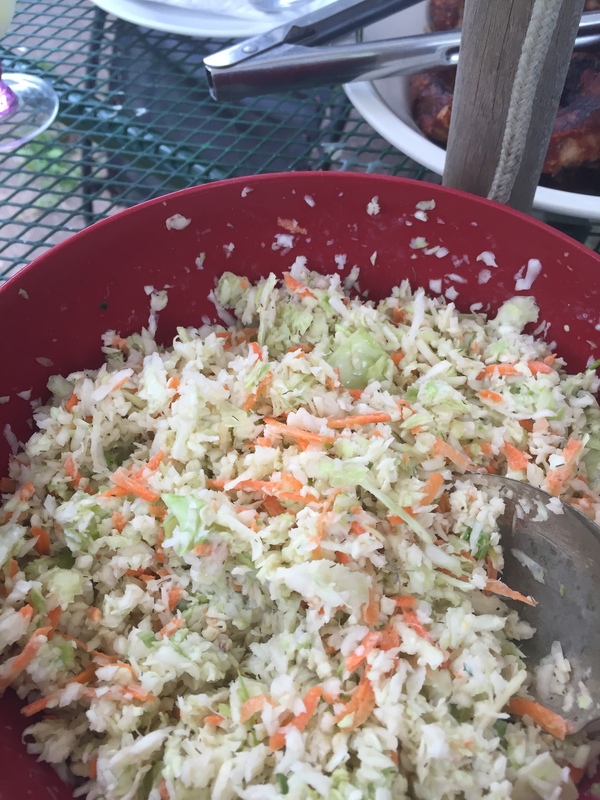 Cole slaw made in my food processor when I just realized that it had a shredder attachment. 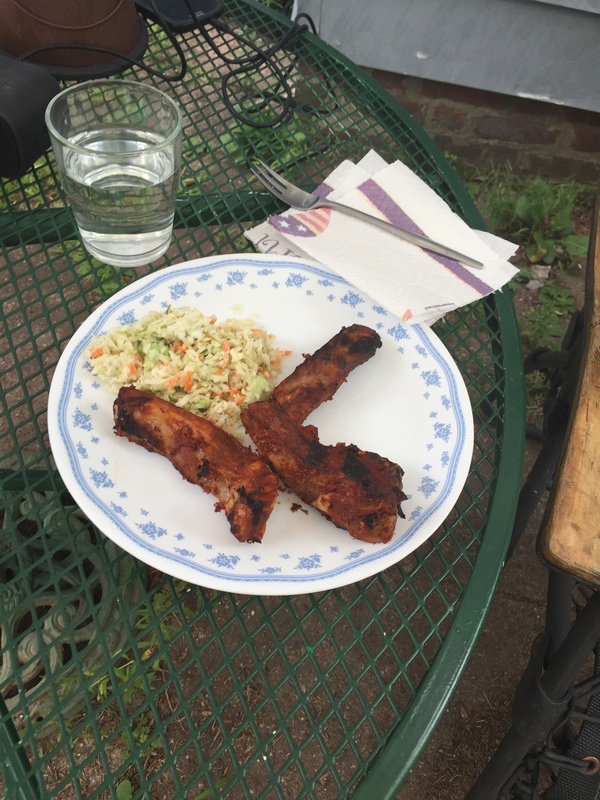 Served with ribs. Dream job: test kitchen cook! 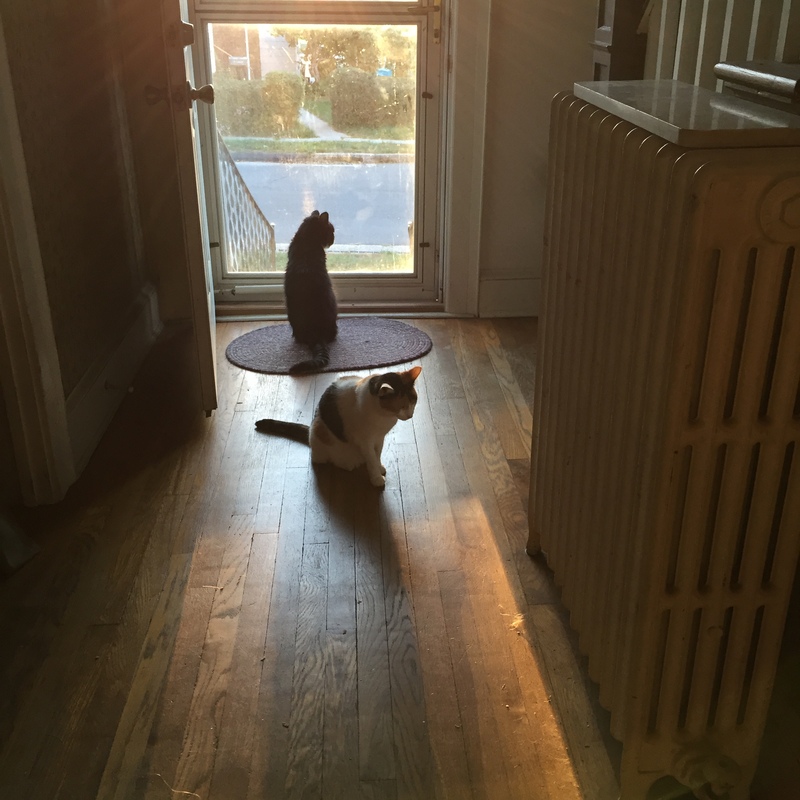 Here’s a picture of the cats. Just a random picture I decided to throw in. I have gained 3-4 pounds since I have been back to baking and not deliberately thinking about calories, portion control, healthy foods, and not eating what is enjoyable. I will just have to start giving away the baked goods. I finally found something enjoyable. I have been baking but have not been completely satisfied with the outcomes. I made that coffee cake and although it was nice right out of the oven with coffee on the lazy morning, it sat on the counter the rest of the week. Well, part of it did. I took half of it to work and my coworkers ate that half. But the rest just sat there. I admit I nibbled at the Crumble (topping) and sent pieces to work with the hubby but that was more like obligation. I baked bread which is fabulous right out of the oven spread with butter, eaten with dinner, but any leftover sits there in the breadbox. I was not happy with the sourdough bread that I made the other weekend, other than freshly baked. 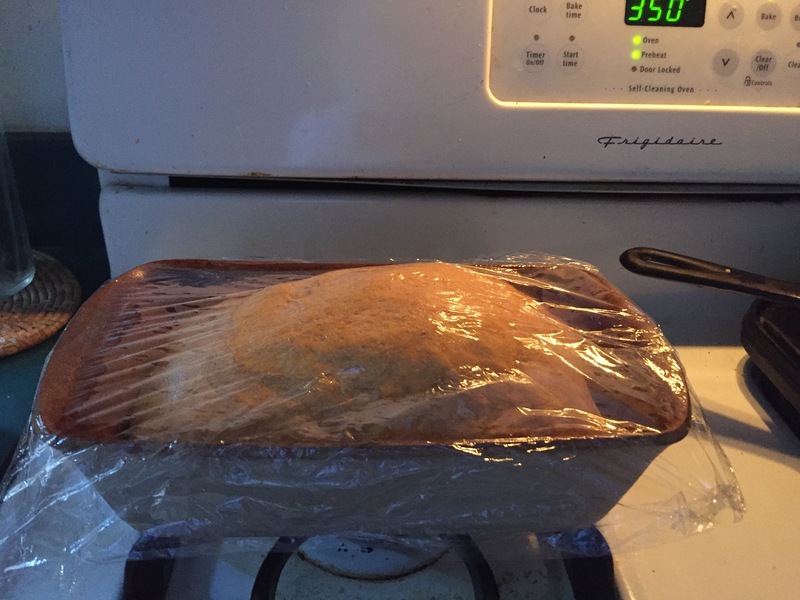 The loaf or boule did not rise well. 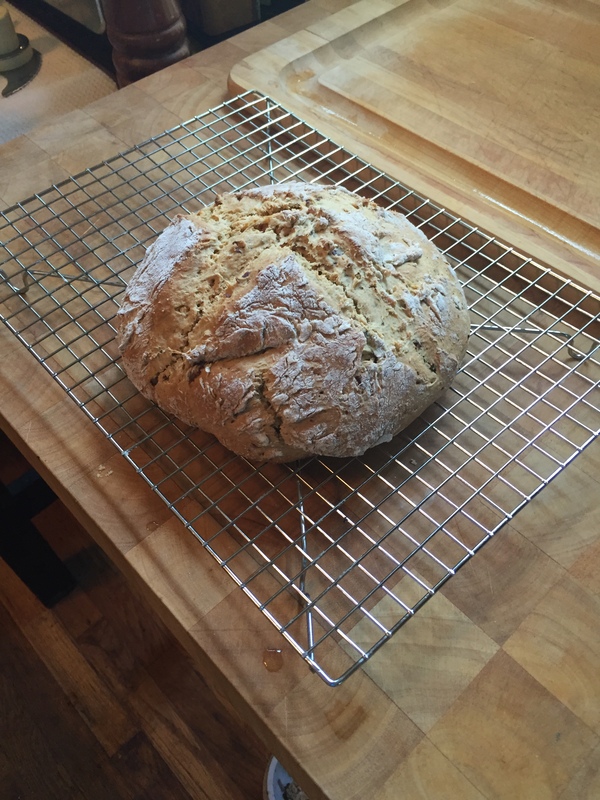 I baked “Artisan Bread in 5 minutes a day” and this was fabulous right out of the oven too. But hubby and I did not gorge ourselves on it and now there is a small piece of this boule sitting along side the sourdough in the bread box. They are not light enough to use in a bread pudding type dish. I may just throw them in the freezer for breadcrumbs or croutons at some future date as long as I don’t clean out the freezer and dispose of them. 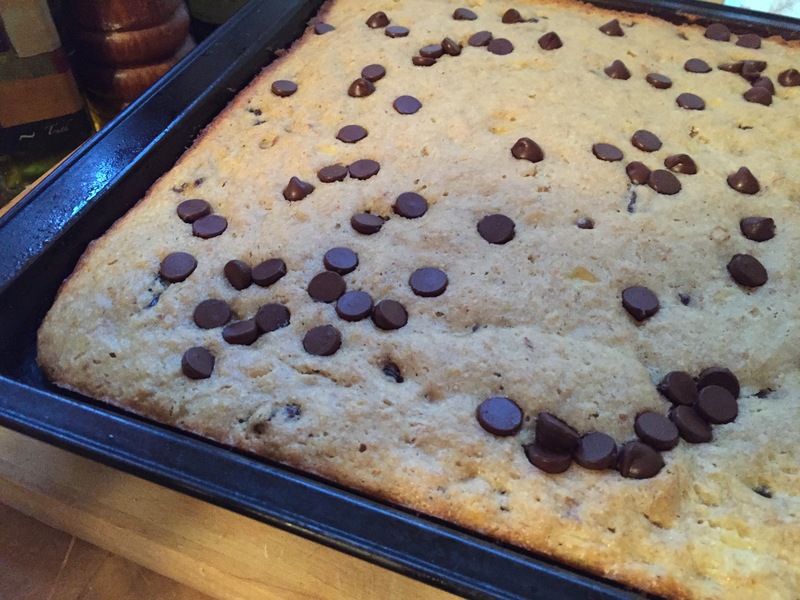 Banana bars: This is another effort to bake through the KAF 200th Anniversary Cookbook. These are on page 356. Not willing to leave well enough alone, I use whole wheat pastry flour instead of regular whole wheat, and I add walnuts and leave out the poppy seeds. 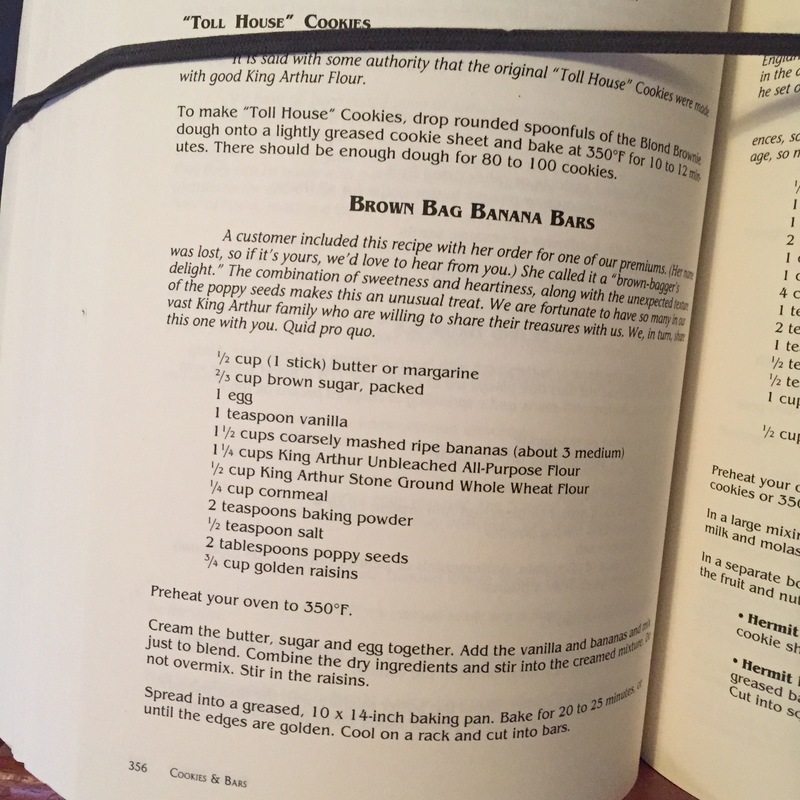 I chose this recipe because I had three over ripe bananas providing their fragrance to my kitchen. I am not sure what it is about KAF but here is another banana recipe that adds cornmeal to the batter. So I mix all this up and spread it in the pan to bake. Just for fun, I sprinkle some Hershey Special Dark Chocolate Chips on top. Voila, banana brownies! And these are tasty. I send half of them to work with hubby to prevent me from eating them all and gaining even more pounds! They are tasty with a glass of cold milk. This is all well and good but as I mentioned earlier I do not leave well enough alone. I am thinking “pumpkin”. I have about three-quarters of a can of pumpkin in the fridge. This is leftover from a pumpkin smoothie trial earlier this week. I can substitute pumpkin for the banana. Why not? I would need to add spices too. 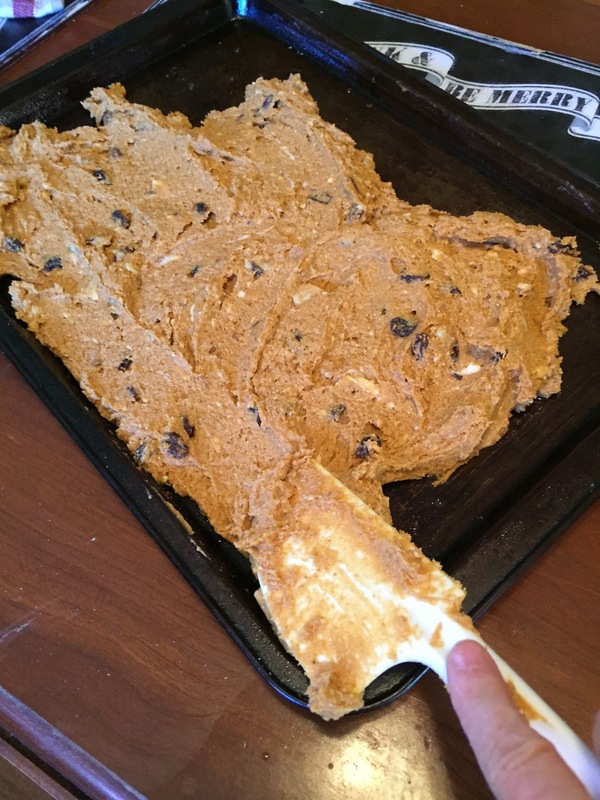 Cream one stick butter with 2/3 cup packed brown sugar and one egg. Add 1 teaspoon vanilla and the pumpkin. (an entire can or 3/4 of a can).Whisk dry ingredients together in separate bowl: 1 1/4 Cup all-purpose flour, 1 Cup whole wheat pastry flour, 1/4 Cup cornmeal, 2 teaspoons baking powder, 1/2 teaspoon salt, 1 teaspoon cinnamon, 1/4 teaspoon ginger, and 1/8 teaspoon ground cloves. Stir in dry ingredients and mix just til blended. Now stir in 1/2 Cup raisins and 1/2 Cup chopped walnuts. Spread in 10 x 14 jelly roll pan that has been sprayed with cooking spray. 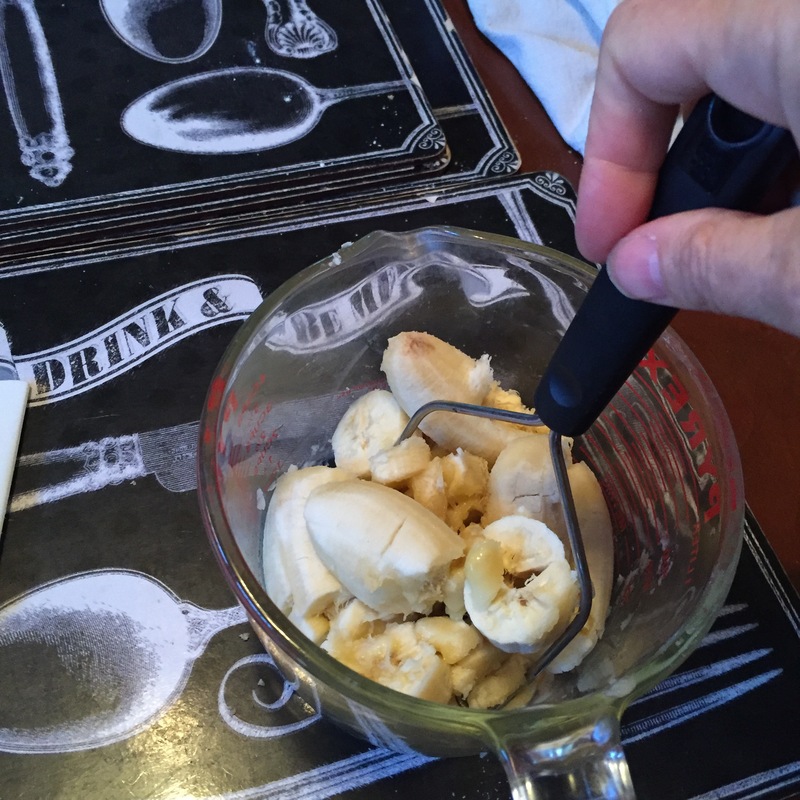 This batter was dryer and more difficult to spread and smooth than the banana bars. But with patience I managed to get it spread. I sprinkled it with chocolate chips and baked it in a 350 oven for 22 minutes. These have a slightly lumpier appearance and chewier texture. They turned out pretty good. Cool!